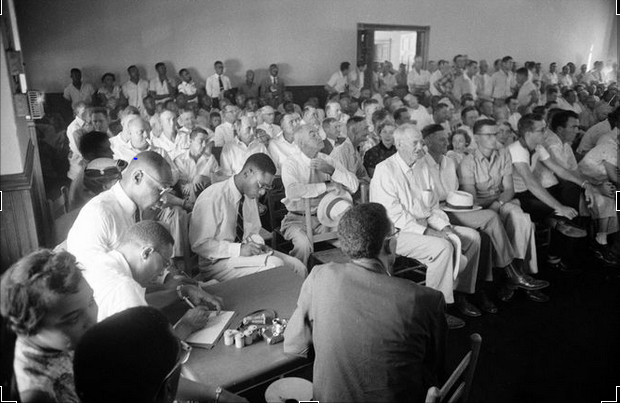 "Emmett Till Murder Trial." Gale Student Resources in Context. Detroit: Gale, 1955. Student Resources in Context. Web. 9 Oct. 2015. "Emmett Till. 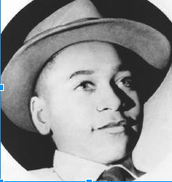 Murdered at fourteen in a small Mississippi town, because white men believed he had..." Dictionary of American History. Ed. Stanley I. Kutler. 3rd ed. Vol. 8. New York: Charles Scribner's Sons, 2003. U.S. History In Context. Web. 9 Oct. 2015. On August 24, Till and a group of other teens went to a local grocery store after a day of working in the fields. Accounts of what transpired thereafter vary. Some witnesses stated that one of the other boys dared Till to talk to the store’s cashier, Carolyn Bryant, a white woman. It was reported that Till then whistled at, touched the hand or waist of, or flirted with the woman as he was leaving the store. Whatever the truth, Till did not mention the incident to his great-uncle. In the early morning hours of August 28, Roy Bryant, the cashier’s husband, and J.W. Milam, Bryant’s half brother, forced their way into Wright’s home and abducted Till at gunpoint. Bryant and Milam severely beat the boy, gouging out one of his eyes. They then took him to the banks of the Tallahatchie River, where they killed him with a single gunshot to the head. The two men tied the teen’s body to a large metal fan with a length of barbed wire before dumping the corpse into the river. "Emmett Till." Britannica School. Encyclopædia Britannica, Inc., 2015. Web. 9 Oct. 2015. <http://school.eb.com/levels/high/article/473787#>.